Play A Round Of Tetris For Your Election Day Anxiety : Shots - Health News There could be an upside to your phone addiction. Games like Tetris can reduce anxiety, according to new research. So if you've got Election Day jitters, go ahead and launch that app. Tetris and other absorbing brain games can get you into a "flow" state that relieves stress. If you've ever played Tetris — whether it was at an old-school Gameboy, or just on your iPhone — then you know: It's 8-bit enchantment. 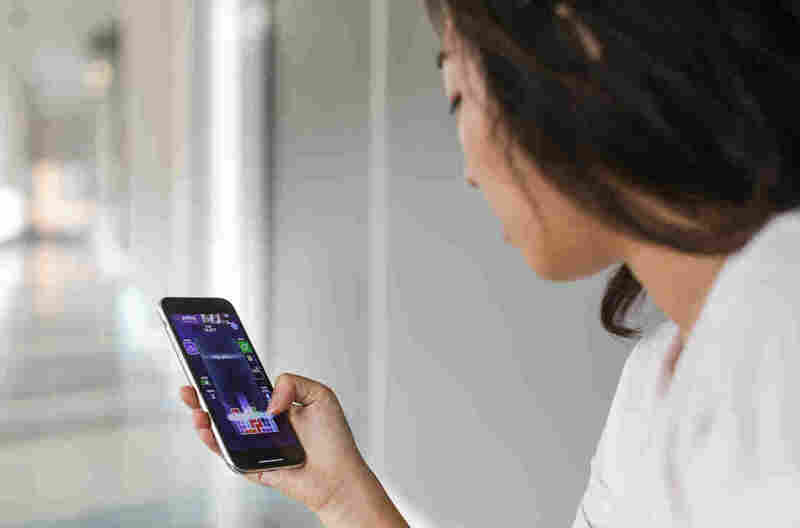 "Years of my life were lost disappearing into a game of Tetris on my Nintendo system," says Kate Sweeny, a psychologist at the University of California, Riverside. But maybe the hours she spent lining those little blocks ("tetriminos") into perfect rows of 10 weren't a total waste. Her latest research suggests that Tetris can ease us through periods of anxiety by getting us to a blissfully engrossed mental state that psychologists call "flow." So say, you're waiting for a date to text you back, or for your LSAT scores, or — as much of the country will be doing on Tuesday — waiting for the election results. You may be tempted to think obsessively about the possibilities. Instead, Sweeny's research suggests, you may want to turn off Twitter alerts, and try distracting yourself with a brain game. The study, published recently in the journal Emotion, focused on people who were waiting for uncertain, potentially life-altering news, and it found that a flow-inducing game of Tetris could help them cope. Some played a painfully slow, easy version of the game — which bored them. Some played an extremely challenging, fast version — which frustrated them. And everyone else played the classic version, which adapts to each player's individual skill level and gets them into that state of flow. The results line up with a growing body of research showing that regular doses of flow can boost our mood and help us manage stress. And although playing Tetris is a reliable way to achieve flow, other absorbing video games would work too. And if you'd rather put down your digital device, no worries. Games are by no means the only way. "Think of the activity that grabs your attention and doesn't let it go," says Elizabeth Dunn, a psychologist at the University of British Columbia who studies happiness. "For me, it's mountain biking." For you, it could be chess or ballet. "I can't say I found this study particularly surprising at all," says Dunn, who wasn't involved in the research. "Mostly because, based on previous research, it's hard to find a situation where the experience of flow isn't a good thing." What the new research does suggest, she says, "is that even in tough moments, we should push ourselves to do something challenging to get us out of the moment." "Go mountain biking, or rock climbing or have games night with your friends where you play really challenging games," she says. And if all else fails, you can always try Tetris. Maanvi Singh is a freelance writer and a regular contributor to NPR. You can find her on Twitter: @maanvisings.